The Hotel Palumbo still preserves reminiscences of the original medieval structure of the 12th Century Palazzo Confalone in Ravello. The five different levels of the building do not correspond to modern day storeys, since the original structure was essentially vertical, but irregular, a small flag like sign hangs discreetly above the main door of Palazzo Confalone. The hall has kept the original nature of court it once had: the ogival arches are of Moorish influence; precious ancient Greek and Roman marble columns from Paestum and the Amalfi Coast; multicolour ceramic floors made of tiles with geometric and floral patterns, Pasquale Vuilleumier and John Huston designed them in 1952 while "The African Queen" was being filmed at the hotel. 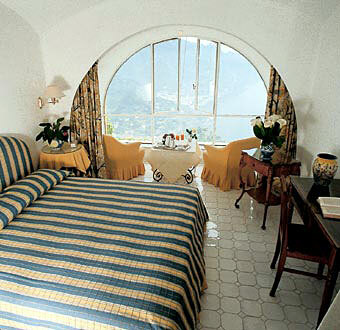 Rooms and suites at Hotel Palumbo feature a mixture of arches, corridors, corners, niches and passageways, a composition of "nests" for the imagination, which opens onto the sun of Ravello and onto the Amalfi Coast's mellow nights. Each room in unique, reconciling the medieval origins of the building with ingenious use of space. All the rooms are furnished with antiques from the 16th, 17th and 18th centuries belonging to the Vuilleumier family. Faithful to the principle of individuality, the detailing in each room is different. The Hotel Palumbo has just twenty-one rooms. If it had more, it would lose the special nature of a private residence for a select clientele for which it has always been appreciated. The astounding blues of sky and sea are enhanced by the intense green of the Hotel's Mediterranean gardens, which blend naturally with the building and its elaborate network of pergolas spreading across the walls and covered with climbing plants. The design of the exterior has been kept as close as possible to the original. 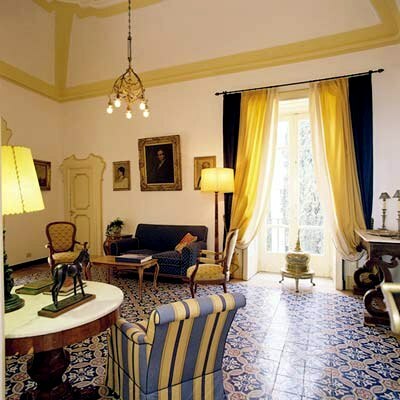 Orange and lemon trees, rose-beds and old vines about a 17th Century colonnade that frames marvellous views of the Amalfi Coast, the Gulf of Salerno and Punta Licosa. 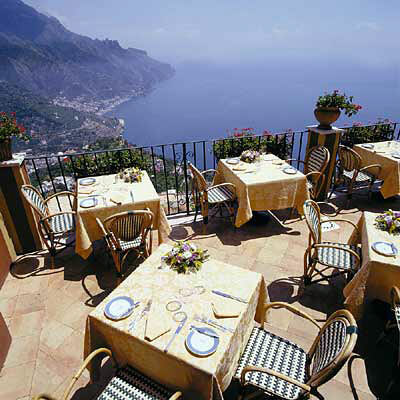 The Hotel Palumbo is located in the centre of Ravello in a panoramic position. 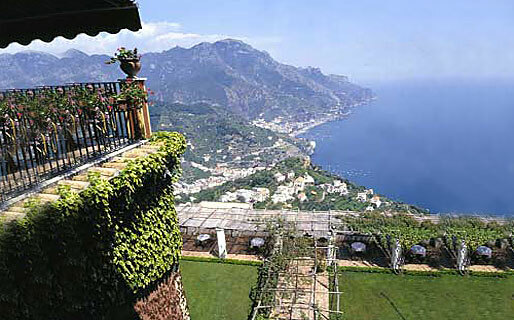 Ravello is a short distance from the most famous resort of Amalfi coast as Positnao, Atrani, Amalfi, Furore.